The leaves are back. I used the leaf sucker on them and mulched them, but they are back. Oh, you think they are pretty and innocent, rustling and wafting gently to the ground. Bull pucky. They are little demons. Even now I can hear them falling, falling, each one screaming as they fall....they must be stopped. It finally dawned on me. Leaves come from trees. Those of you who have been stopping by for awhile may remember my encounter with the curse of a couple of trees I had cut down two years ago. There was wood everywhere that I just couldn't get rid of. So maybe the leaves are part of that curse. Damn you leaves, leaf me alone! I'll win. 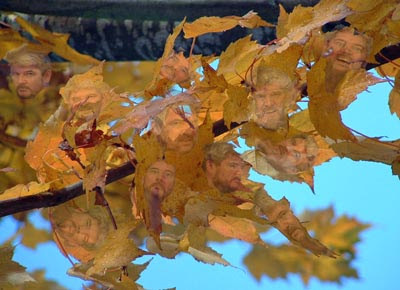 I'll keep leaf sucking until there isn't a single one of you left. This is some of the same OCD that manifested itself in your summer obsession with lawn mowing. Seek help. There are medications. Life doesn't have to be this way. Whitesnake, Even though your toilets flush counerclockwise, I like you dude. Kristy, This coming from a person who concentrates on incidents of beastiality in Western Washington doesn't really bother me. Tim, I had no idea that you had so much invested in "Dances with Leaves". Go ahead, Tim, grieve, let it out, get it over with, don't let your loss manifest itself in endless posts concerning your fruitless battle with nature. Eventually, you will let go, and come to love and appreciate "These Thoughts...". Trolls, Hayden? How many trolls can you spot? That hurt. THE Michael, It dawned on me after the post that perhaps there was some subconcious message about your turning your back on "Dances with Leaves" by calling this entry "Silence of the Leaves." But then I just said, "Nawwwwwwwww."